This amazing 2018 Great Britain 2 oz Silver Queen's Beast (Unicorn of Scotland) Coin is the fourth edition in the highly-praised Queen’s Beasts series from the notable Royal Mint. The magnificent Queen’s Beasts series was introduced by the British Royal Mint in 2016 with the “Lion of England” coin. This coin program features the ten beasts that stood at the Queen’s coronation and each beast supports a badge of arms of a certain family associated with the ancestry of Queen Elizabeth II. The first issue was followed by the “Griffin of Edward III” and the “Red Dragon of Wales” coin, and will also feature the Black Bull of Clarence, the Falcon of the Plantagenets, the Yale of Beaufort, the White Lion Mortimer, the White Horse of Hanover, and the Unicorn of Scotland. This edition features a stylized image of a unicorn. The Unicorn of Scotland has been brought to life in a contemporary design by prestigious Royal Mint coin designer Jody Clark, who created the current coinage portrait of Her Majesty. 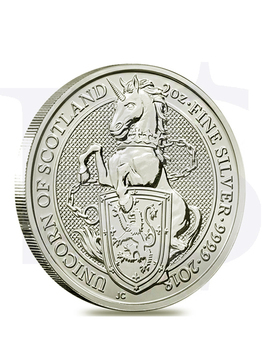 The reverse depicts the Unicorn of Scotland. This magic animal is shown standing on its rear legs with its front hooves dangling over the royal badge of England, which includes an image of the Lion of England. 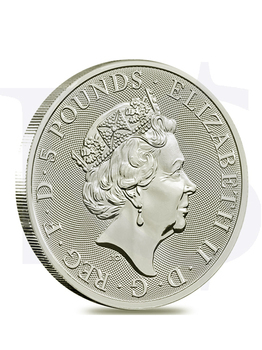 The obverse features the latest effigy of Queen Elizabeth II, the same portrait as seen on all coins in the British Queen’s Beast Collection. Her Majesty Queen Elizabeth II is captured in right-profile relief., this artwork created in 2015 by Royal Mint engraver Jody Clark. Made from .9999 pure silver with a weight of 2 oz. Produced by the notable Royal Mint. Individual coin comes in a plastic flip. Multiples shipped in 10-coin mint roll and a Monster box of 200 coins. Struck with a £5 (GBP) face value. 4th coin issued in the popular Queen’s Beasts series. UK legal tender coin backed by the UK Government. Obverse: Features the effigy of Queen Elizabeth II. Inscriptions: “Elizabeth II”, “D.G. REG F.D” (Queen by the Grace of God) and the coin’s denomination. 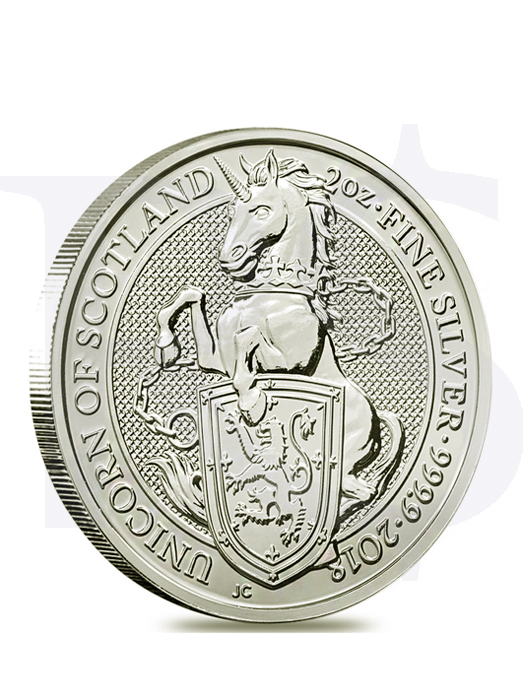 Reverse: Showcases a stylized image of the Unicorn of Scotland. Engravings: “2018”, along with the purity and weight.